Alex Wilkinson is a musician and recording engineer whose fledgling company make a variety of software and hardware products. On the software side are signal-processing plug-ins, virtual instruments, and drum and guitar-amp samples, while the hardware side currently comprises an interesting collection of specialist mic-mounting accessories. All bar one of these Wilkinson Mic Clips are designed to support two mics in a precise physical relationship to each other. The one exception is an adapter for the Sennheiser MD421 (a mic with a notoriously frustrating mounting bracket) that allows it to be used with a standard SM57-style clip. This review focuses on: the two stereo mounts intended for ORTF and X-Y arrays using a pair of Neumann KM184s (and similarly-sized mics); a mount designed to support an SM57 alongside a KM184; and a ‘Fredman’ mount for two SM57s. All mounts can be ordered in a tough black or (slightly less expensive) white ABS plastic, and they’re produced to order by a 3D-printing process. The Wilkinson brand name is printed into every clip, but there were no other markings on the review samples to identify the model — though as identifying the X-Y and ORTF mounts isn’t actually that easy, Alex tells me appropriate labels are being engineered into the 3D printing files (they’re already in place for the mounts intended for supporting AKG C451s). 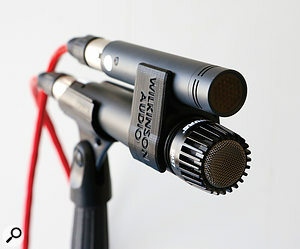 The X-Y clip, holding the mics nearer the capsules than the ORTF version.The X-Y and ORTF stereo mounts are designed to support a pair of identical mics at specific angles relative to each other — the X-Y version positions the capsules at a mutual angle of 90 degrees, and does so from a position fairly close to the business end of the mics. When attached, the mics are offset slightly in the vertical plane to allow their capsules to sit neatly one above the other, as closely as possible. The plastic doesn’t feel brittle but doesn’t have much ‘give’, either, so inserting each mic requires some effort. Once installed, they’re held very securely, and a traditional ‘stereo bar’ is no longer required — only one mic needs to be attached to a mic stand. This makes for a neater and quicker set up, with much less ironmongery at the top of the stand for neater sight-lines. However, as the one stand adaptor is now carrying double the weight, it does need to be in good condition and with a tight hinge, otherwise the whole array droops! One important, inherent limitation is that it becomes rather difficult to employ effective shockmounts. I almost always use individual Rycote InVision INV-7 shockmounts with my KM184s — this design has been carefully optimised to provide the greatest compliance (and thus vibration rejection) in the plane perpendicular to the diaphragm. Unfortunately, the Rycotes cannot be employed with the two mics clipped together, and I’m not aware of any other shockmount design currently available that would be effective in this application. Although it’s probably obvious, I should point out that Wilkinson’s KM184 clip works with any other mics with 22mm-diameter bodies, including the Oktava MK-012, MXL 604 and AKG Perception 150. For slimmer mics, Wilkinson make variants for 19mm (AKG C451, AKG SE300, Groove Tubes GT-33, Soyuz SU-011 and more) and 20mm (Rode NT5, Audio-Technica AT4021, Beyerdynamic MC930, Neumann KM84, Schoeps CMC6 and more) bodies, which should cater for most requirements. To the casual eye, the ORTF clip looks almost identical to the X-Y one, but the angles are slightly different and it’s intended to be placed near the connector end of the mics. 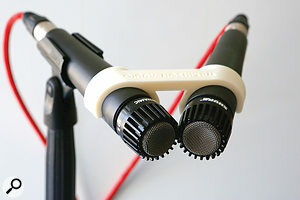 Again, the two mics are offset slightly in the vertical plane to allow the XLR connectors to be plugged in. As with the X-Y mount, only one of the two mics actually needs be attached (via its own stand adaptor) to a mic stand. When I’m rigging ORTF arrays I’ve long used a sheet of acetate on which I’ve printed the appropriate spacing and angles, to help get things aligned quickly and easily on a stereo-bar. I have to say, though, that the Wilkinson clip offers a much faster solution: positioning the Neumann diamond badges on each mic exactly in the centre of their clips ensured that the two capsules ended up exactly 17cm apart, and at a mutual angle of 110 degrees to each other. I expect similar ‘visual aids’ could be found with other mics, too, such as referencing the optimum position against a body fixing screw or model number. The same shockmount restrictions apply with the ORTF mount as with the X-Y model, of course. 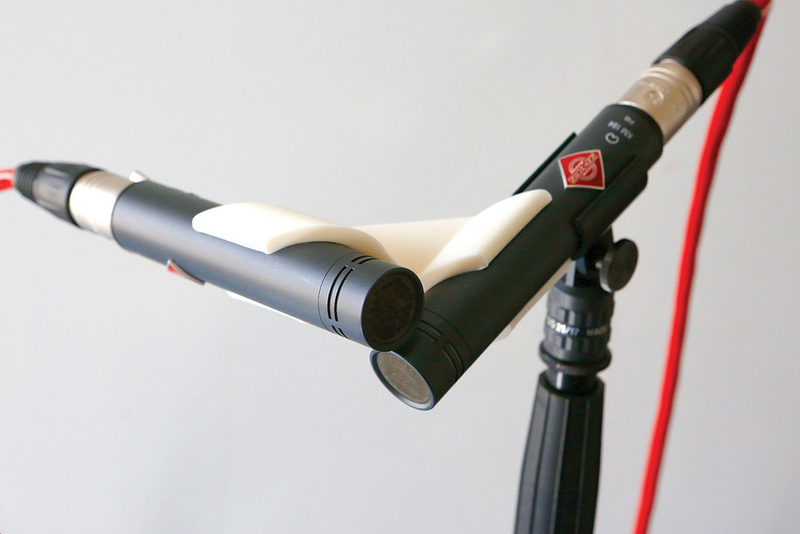 A clip to align an SM57 with a small-diaphragm condenser, in this case a Neumann KM184.The SM57/KM184 clip is also available in variants to partner the SM57 in a parallel alignment with an AKG C451, a Rode NT5, a Behringer ECM8000 measurement mic (clamping the mic around the narrow capsule stalk rather than its main body), or even a second SM57. This clip configuration is intended to time-align the dynamic SM57 capsule alongside a high-quality capacitor mic — a technique often employed when miking guitar amps, snare drums and so on, allowing the weight and body of the dynamic mic to be blended with the attack and detail of the capacitor mic without phasing or comb-filtering problems. 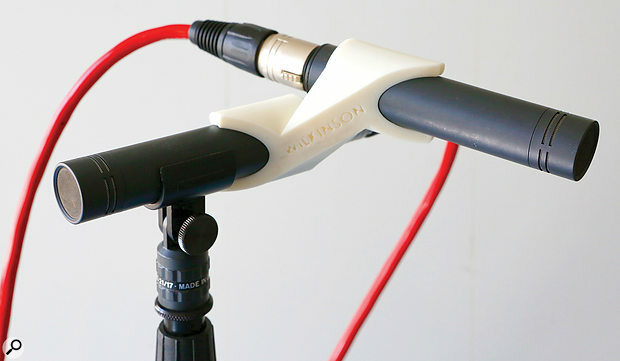 Wilkinson’s clip attaches to the SM57 around the cylindrical part of its body just behind the grille, and the capacitor mic’s diaphragm can then be positioned to be level with that of the SM57 for accurate time-alignment, or even slid forwards or backwards if preferred to achieve a certain ‘phase offset’. Again, the whole array can be attached to a mic stand using either the SM57’s standard adaptor at the base of the mic, or the capacitor mic’s stand adaptor, whichever is more convenient. And so to what I find the most intriguing mount, the Fredman clip. This is named after the Swedish ‘Studio Fredman’, where the metal band In Flames recorded their Clayman album with producer Frederick Nordström in 2000. (This mounting configuration is also known as the ‘Clayman technique’ after the album, rather than the studio!) This mount is a bit like a larger version of one of the previously described stereo mounts, and positions a pair of SM57 microphones with a mutual angle of 45 degrees facing towards each other. Again, as the one stand adaptor will be carrying twice its normal weight when using the Fredman clip, it is important that the stand adaptor is in very good condition, and fully tightened! The Fredman clip, designed to hold two SM57s at different angles in relation to a guitar cab.The Fredman/Clayman guitar-amp recording technique requires one mic to be positioned very close, square-on, and central to a guitar amp’s speaker cone, while the other is held as close as possible and at 45 degrees shooting across the straight-on mic. The outputs of these two mics can then be blended together to taste, the inherent HF phase cancellation being claimed to help achieve a desirable guitar tone with less ‘fizz’. I’m told this technique has become quite popular in heavy-metal circles, and this clip makes it extremely quick and easy to set up, using a single mic stand. 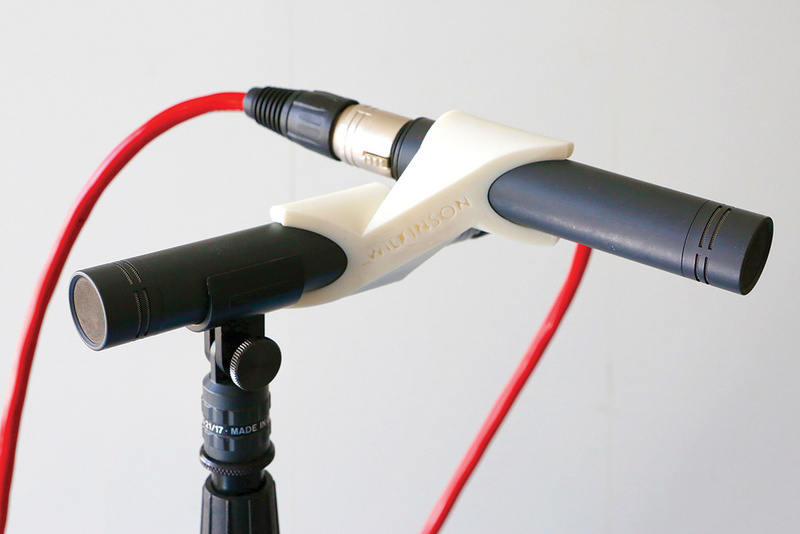 Alex Wilkinson has designed this collection of dual-mic mounts to solve specific practical problems he’s encountered when engineering his own recordings. They all do exactly what his web site claims, they’re very cost-effective and accurately sized, and they hold the mics very securely. They feel robust, too. I did notice a tendency to leave some white marks on the mic bodies (especially the SM57s) but this isn’t problematic: it’s probably just a dusty residue from the freshly-made clips, and the marks clean off very easily with a soft damp cloth. There are two areas, though, where I feel these clips are sub-optimal and which may be sufficiently frustrating to dissuade their use. The first is the expectation of the mic’s normal stand adaptor to carry the weight of two mics without drooping — something with which I encountered problems — and the second is the difficulty in using these clips with shockmounts. The first would be overcome if the Wilkinson clips could be re-engineered to become stand adaptors in themselves, and perhaps Wilkinson’s engineering ingenuity could also be turned to developing a suitable multi-plane shockmount integrated into these clips as well. That really would be neat, elegant, and considerably more practical. Despite all that, as they stand now, these clips are useful, robust, and highly effective. Moreover, they’re a great example of how 3D-printing technology can help small innovative businesses to manufacture bespoke and niche products that simply wouldn’t be viable using conventional techniques. ORTF, X-Y, SM57 and Fredman clips all $15 (white)/$20 (black) each. MD421 clip $25 (white)/$30 (black).